Kleefeld on Comics: It's Monkey Day Links! December 14 is Monkey Day! Please celebrate responsibly. 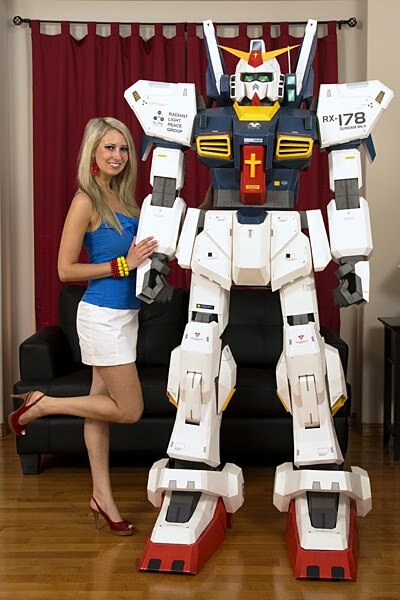 Here's a cool-looking Gundam that's seven feet tall. Now, be amazed when I tell you that Taras Lesko designed and constructed it himself out of 720 sheets of paper! PAPER!!! Columbia Journalism Review just republished this piece from 1965 which looked had how "consistently propagandistic" comics of the Cold War and how they may have actually influenced popular opinion. I love pieces like this, as they provide a closer-to-first-hand view of what are now historical comics. Did I mention that Gundam is made out of paper?!? Salon has some coverage of Hero, Villain, Yeti, the Rubin Museum's exhibit on Tibet's portrayal in comics over the years. It's supposedly a pretty extensive collection on display, though I saw no mention of the Inhuman's "Hidden Land." Chip Kidd presented earlier this year at the AIGA Design Conference. Here's video of his talk on getting tapped to write an original Batman graphic novel. I know this has circulated a bit already, but Doc V's look at Timely's Best Western is really impressive and worth a read. Lastly, I'm not quite sure how I would categorize this or whether it's really worth mentioning on a comics blog, but Joe Bonomo recently interviewed Jim Linderman. Linderman collects... stuff. He's not a hoarder and regularly dumps his collection of whatever-it-was-that-he-was-collecting. He has some interesting thoughts on why he collects what he does, and what he gets out of collecting. It's not really comics related per se (though he does mention Robert Crumb once) but it's a curious aside to fandoms more generally.